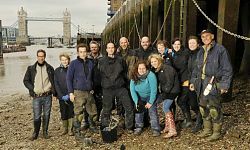 If you enjoyed the BBC series Digging for Britain with Dr Alice Roberts you can watch clips from the programmes on YouTube, including some additional footage from the foreshore at Greenwich with Graham Kenlin from MoLA, and Nick Stevens and Steve Brooker from the Thames and Field Metal Detecting Society. A second series of Digging for Britain has been commissioned so watch this space for further updates! Also coming soon is a new eight part series from ITN Productions which will be broadcast in February 2011 on the History Channel. 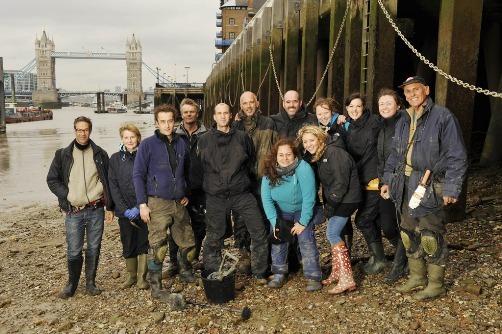 In the series, Johnny Vaughan embarks on an historical adventure, exploring the archaeology of the River Thames, teaming up with Steve Brooker to explore the artefacts on the foreshore and to discover more about how they were made and who used them and where. >> Nominate TDP volunteers for this year's FROG Awards! >> Job opportunity with TDP and MOLA! >> Britain at Low Tide is Back!